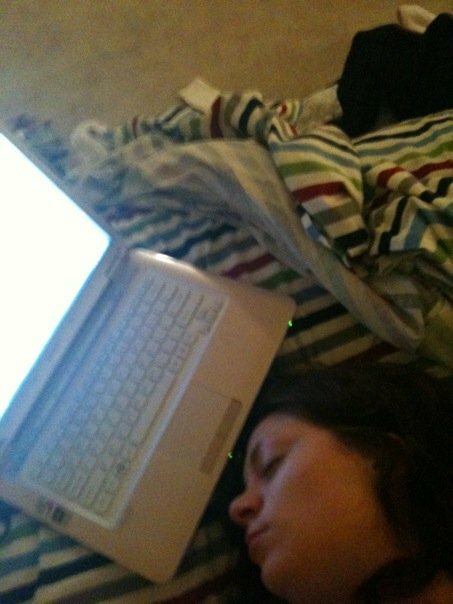 This is me at the end of NaNoWriMo 2009. DONE! So it’s National Novel Writing Month again. I am not participating this year. Much as I would love to try it again, I’m still finishing up edits on The Demon Within. My final deadline is December 1, and I’m hoping to get it done sooner. But I have participated a couple of times before, and I won back in 2009. Although that particular story never went anywhere, I always look back on that month and that time with fondness. I consider it the beginning of the “modern era” of my writing. (That sounds horribly pretentious, doesn’t it?) I had just gotten out of a long-term relationship, so I had more time to write. Moreover, it was the first time since I had graduated from college that I really gave myself permission to write, and permission to live my life the way that I wanted to. I realized that the only person keeping me from the writing career I really wanted was me, and that I needed to live my life on my terms. I couldn’t let a day job or unsupportive loved ones stop me. I needed to do this for me. In other words, NaNo 2009 was the equivalent of opening a dam. I think, had I not participated in NaNo that year, I would not have completed–or maybe not even begun–the books I’ve completed since then. —Have an idea ahead of time. You have to write 50,000 words in 30 days. Nothing is more intimidating than staring at a blank computer screen, knowing you have 1,556 words to get in, and having no idea what to write. I’ve always been more of a pantser than a plotter, but before I start writing anything–regardless of whether it’s NaNo or not–I have to have some kind of idea of a beginning, middle, and end. Your month is only limited to actual story words. You can do as much thinking, as much plotting, as much outlining, as much inventing as you want before November 1. —Try to get ahead of the game early. The first couple of days, when I was all pumped up and motivated, I got a LOT of words done. That helped me later on, when I was in the sludgy middle section and couldn’t manage to force the words out. —If you don’t live alone, prepare your family for what’s going on. I had just gotten out of a relationship when I started NaNo that year. For the first time in my adult life, I was living on my own, and it was amazing. Living alone gave me the freedom to do what I wanted, when I wanted, and be answerable to no one. –Don’t forget to have personal time. It can be very tempting while you’re doing NaNo to write to the point of exhaustion, forget your friends and loved ones exist, and basically kill yourself for 30 days. Don’t do that. The point of NaNo is to get yourself writing, not to give yourself a nervous breakdown. 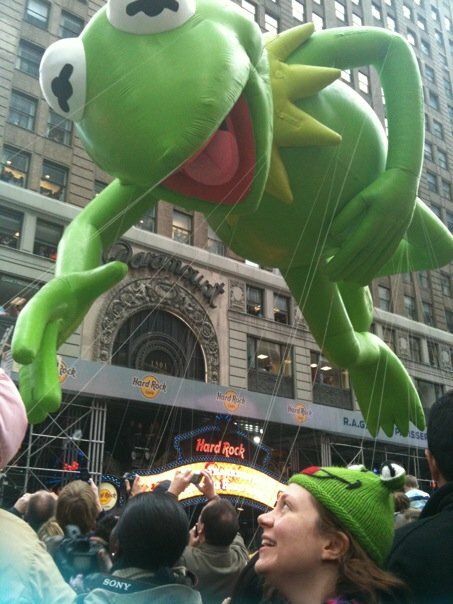 The year I won NaNo, I went to Macy’s Thanksgiving Day Parade, and Kermit almost ate my head. I wasn’t sure whether I should go, but it was a unique opportunity and I didn’t know when I’d have a chance again. Worth. It. —Take chances with your writing. You may have a plan. Maybe you have a detailed outline and character sketches and notes galore. But don’t be afraid to toss it all out the window, say, “Screw it,” and kill someone unexpectedly. Or whatever. This is a lesson I continue to employ in my writing now. I can’t tell you how many characters in The Demon Within ended up dead who weren’t originally killed, how many scenes popped up unexpectedly, how many characters developed out of narrative necessity. You may have a plan, but sometimes plans change. And that’s okay. If it doesn’t work, you can always go and change it back later. Don’t self-censor at this point. –Have fun! This seems so obvious…but at times, it’s oh-so-difficult. Writing is work, and no matter how much I enjoy the process, it’s not fun all the time. But NaNo, I feel, is more like skydiving than neat, orderly novel writing. I don’t even know that you should be thinking about publication while your writing your NaNo novel (though I totally was). I feel like it should be more just getting out the words, letting them fall on the page where they may. We all started writing because we liked creating people and worlds and stories. Maybe this 30 days should be about bringing the joy back into writing again. Like I said, that novel I wrote back in 2009 never went anywhere. I’m tempted to brush it off one of these days to see what I can make of it. But I have never regretted the process of writing it, because I know if I had not, I would not be where I am with my writing today.